Ono grindz, that's Hawaiian for good food. And ono grindz is in abundance here. You could eat yourself to death -- I at least am appreciating those floral mu-mu dresses, that appear more tent-like than fashion -- having started to eat my way through town. 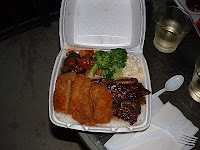 I had mentioned deck dining in an earlier post -- this photo was my $10.50 dinner: chicken katsu, bbq pork, potato salad, broccoli (I had to have something healthy) and two types of kim chee, the spicey Korean vegetables and of course two scoops of rice. Yes, that was my plate; Joel had his own. Wine, purchased at the local grocery, brought the cost of the meal to less than $35. . .and we've had leftovers for two lunches. We followed the advice of local columnists at The Honolulu Advertiser (http://www.honoluluonthecheap.com)and/ tried Happy Hour at the Sheraton Hotel's RumFire; a place with million dollar views and great Happy Hour prices ($3 draft beer, $5 wine and $5 mai tai) Pupu's were of gourmet quality and greatly reduced during the 4 p.m. - 6 p.m. daily Happy Hour. Aha, you got "plate lunch" which you can find all over the Hawaiian Islands. Very tasty and a good travel meal bargain. A toast to the tropics. . .
Havin' a 'Bowl' in Vegas!